Support the Combe Haven 19! 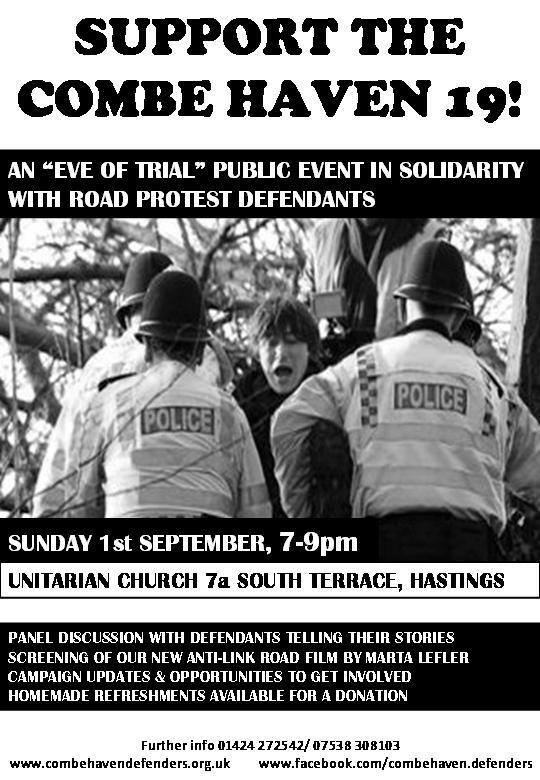 Public event on 1st Sept.
Join us on Sunday 1st September at the Unitarian Church, 7a South Terrace, Hastings TN34 1AS, from 7:00 till 9:00pm for an evening of celebration and solidarity on the eve of the first of six trials of 19 road protest defendants running through September and October! We will premier our new short film on the campaign, with an introduction by the film maker, Marta Lefler. This will be followed by a panel discussion with some of the defendants, giving their own accounts of taking peaceful direct action and dealing with the legal system. There will also be an update on the campaign against the road and how you can get involved, and an opportunity to sign up for trial support and helping with defendants’ accommodation needs. Delicious home made cakes and refreshments will be available for a donation towards much needed campaign funds. Contact us if you can contribute a cake or savoury for the evening.